Wonderful ornamental and edible plant. 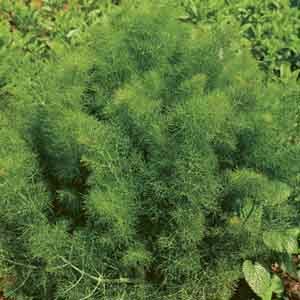 The soft feathery foliage adds an airy texture to the garden and the foliage has a sweet, anise flavor that is ideal for seasoning a wide range of foods and sauces. Very desirable herb garden addition also looks great in any bed, border or container. Leaves and seeds can be used in stews, salad dressings and bread. Wash fruits, vegetables and herbs thoroughly before eating. Very easy to grow in virtually any location. Best in fertile, well-drained soil. Keep soil moist, watering freely in dry weather. Harvest as needed.